Here, are top 5 free Android audio books apps. The concept of Audio books started creating buzz around the 90’s when Compact Disks came to the market and people started listening to books on their audio systems. The biggest advantage of audio books is that they are perfect for busy people who do not have time to sit and read books. Lets get into each Android audio books app. MortPlayer Audio Books has a great future potential. This Android audio book app is still in beta version but has received the best rating in its category on Android Market. This audio books app offers the best listening experience. The audio book player is excellent and looks like premium music players like PowerAMP and WinAMP. This one is the best player in audio books app. However, there is no online store in the app where we can purchase or download audiobooks. MortPlayer supports almost all audiobook formats. This Android app for audio books works on the main directory and subdirectory on a phone’s SDcard which generally is “sdcard/audiobooks”. Other features of this Android audio books app include theme support, home screen widgets, equalizer and bass boost (only in Gingerbread). iPhone users can check out our featured on Audio Books for iPhone. 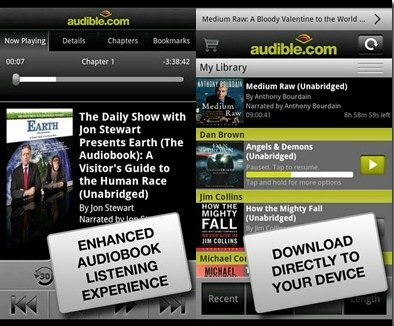 Audible.com, the popular premium audio books store, presents its own audio books app as Audible to download and to listen audio books. This audio books app is the most downloaded Audio Book app on Android market with more than 15K downloads. You need to register yourself with audible.com, in order to access the features of this Android app. Audible is a complete solution for listening to audio books. More than 100,000 audio books can be accessed through this app. Audible app for Android also lets you share your hearings on Facebook and Twitter. Moreover, you can listen to audio books while they are being downloaded. 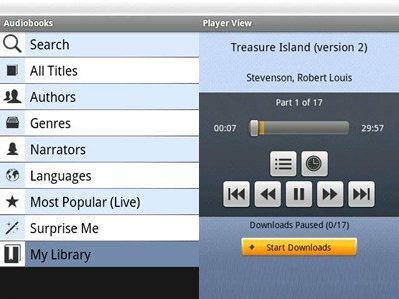 OverDrive Media Console is a library based app for downloading and listening audio book. 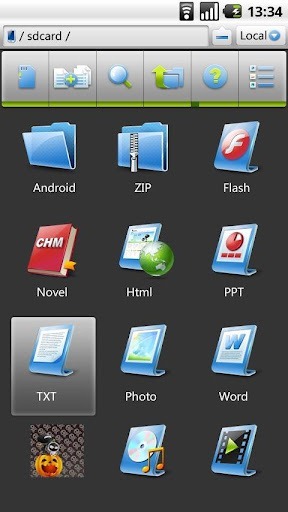 You can download audio books, download eBooks directly from the online library to your Android device. More than 15 thousand public, school and college libraries are included in OverDrive Media Console. 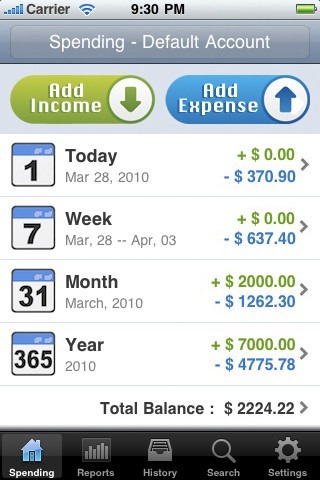 Linking of the library card with this app is needed in order to get the maximum out of this app. Audio Book playback is easy, and control are basic. Feel free to browse around more Android Apps reviewed by us. Audiobooks is one of the best Android audio books app for listening audiobooks for free. 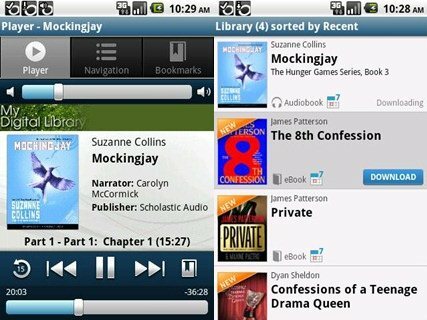 This audio books app gives you access to more than 2800 free audiobooks. 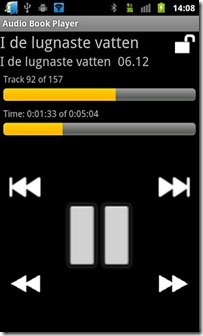 The play controls are basic and resemble with music player for Android phones. New version of this Android audio books app includes sleep timer function which stops playing the audio books after the specified time. Automatic bookmarking helps to keep track of the reading. The reading will start from the moment you left before. 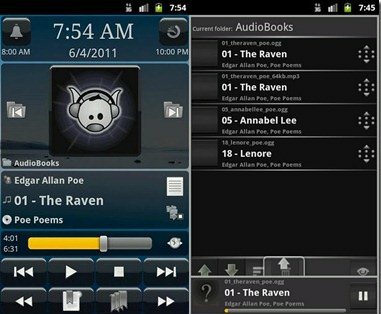 Audiobook Player 2 is a simple Android audio books playing application for Android users. This audio books app is ad-supported, and the ad-free version costs around $4.5. Audiobook Player is developed to give night-time audiobook listening pleasure. The Android audio books app has a simple user interface and is extremely easy to use.